I want to tell you a story. It’s an evolving story, so I can’t tell you how it’s going to turn out. I’m hopeful that it will turn out just fine, but I am a realist, so I’m not getting my hopes up. I won’t share everything with you. But I do feel that I need to share at least some of this story. For now, I’m just going to tell you the beginning. It was 1995, and I was home for the summer, having just finished one year of graduate school in Georgia. I was getting a Masters degree in psychology, and I had recently decided that I was not on the right track. My new plan was to live with my parents for a short time while I took the undergraduate science classes necessary to take – and hopefully pass – the medical school admissions test (the MCAT). It was going to be some time away still, but I thought I might be interested in psychiatry, or maybe even neurology. When I moved home, I had a room next door to my brother. He was 18 or 19 at the time, and he couldn’t seem to get his act together academically. Despite being a very smart kid, once he was in high school, his grades began dropping. He could have graduated from high school if he’d made up one class in the summer following his senior year. He chose not to. Those first few weeks home were difficult for me. I was commuting about 45 minutes each way to attend my classes. I was looking for – and eventually found – a job to pay for those classes. In between, I made time to study for physics and chemistry and biology. At night, I went to sleep with formulas spinning through my brain. And every night, for what seemed like a very long time, I would awaken to hear my brother next door in his room. He was awake and talking to himself, laughing, and occasionally arguing. He never seemed to sleep. Which meant that I got very little sleep. I was fed up with him, with not sleeping, with all the pressure I was under in my coursework. Mostly, I just wanted to sleep at night. I assumed that he was just acting like a jerk and purposefully trying to keep me up. One night, I went next door to my brother’s room and confronted him. I yelled at him and he yelled at me. It was the worst argument we’d ever had, and I don’t remember much of it. What I remember is that he stormed out of the house and left. The next day, he still had not come home. This is what we were told by the medical personnel when we ultimately got the phone call: He was alive but in the hospital. He was in a single-vehicle accident on a rural road in a neighboring county. He was acting bizarrely and it was felt that he was high on hallucinogenic drugs of some sort, maybe LSD or PCP. He was flown in a helicopter or taken by ambulance [the details are fuzzy this many years later] to the major hospital in the region. A drug screen was done and was negative. He was not on drugs. He was in full-blown psychosis. That was his first hospitalization for what became a diagnosis of schizophrenia. People don’t talk much about schizophrenia. There’s a stigma attached to having a mental illness or loving someone with a mental illness. My family and I have been dealing with my brother’s schizophrenia for over 16 years, and WE never talk about it in public. I’ve never really discussed it here, even though I talk about other personal things that affect me profoundly. Only a few close friends know about my brother’s diagnosis. Our extended family know some, but not all, of what we’ve been through. I don’t want sympathy. I just need to tell this story. Mental illness affects so many people – both those affected and the family members and loved ones of those with the illness. We should be helping each other more, supporting each other. We don’t talk enough about it. I’m ready to change that. A few weeks ago, on Memorial Day weekend, we drove out to my parents’ home to have a cookout. My parents still live about 45 minutes away, in the very rural one-stoplight town I grew up in. My mom and dad live in an old farmhouse that they remodeled many years ago, after I moved out for good. My grandmother has lived with them since she was diagnosed with lymphoma about 15 months ago, and my brother – younger than me by 4 years – lives in a little house just behind theirs and connected by a deck my dad built. I brought a homemade blueberry cobbler, made with the fresh blueberries we picked earlier that weekend. My mom requested the cobbler. She never asks for anything, so I had no intention of telling her no. My mom has been a caregiver for the last 16 years, when my brother was diagnosed. She became a caregiver for a second time when my grandmother was on chemotherapy and radiation for lymphoma. In January, she became a caregiver for my father, too. She has the hardest job of anyone I know. It’s a physical, mental, and emotionally draining job. She never gets a day off. And she never asks for anything. Except blueberry cobbler. Place oven rack in middle position and preheat oven to 400 degrees F. Line a rimmed baking sheet with foil. Make filling: Combine the filling ingredients - light brown sugar, tapioca, cinnamon, nutmeg, blueberries, lemon juice, and lemon zest in a bowl and stir well to combine. Place fruit filling in a 9-inch deep dish pie plate or a baking dish. Place the baking dish on the foil-lined baking sheet and bake until the fruit begins to release liquid (20-30 minutes if using fresh blueberries; 40-50 minutes if using frozen). 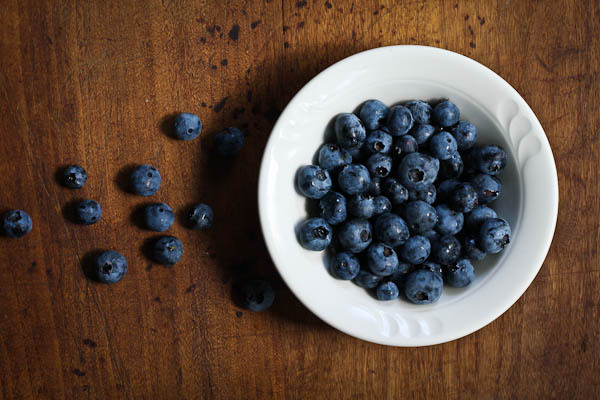 Make topping: While blueberry filling is baking, whisk the flour, 1/4 cup granulated sugar, baking powder, baking soda, and salt together in a large bowl. In a second bowl, whisk the buttermilk, melted butter, and vanilla together. In a third, small bowl, combine the cinnamon and 2 teaspoons of granulated sugar together and set aside. 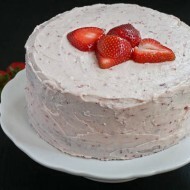 When the blueberry filling has begun to release liquid, stir the buttermilk mixture gently into the flour mixture with a rubber spatula, until the dough is just combined and there are no dry pockets remaining. Remove the blueberry filling from the oven and stir. Pinch topping dough into 8 equal pieces and scatter evenly on top of the hot filling. Sprinkle dough with the cinnamon sugar. Return cobbler to oven and bake until the filling is bubbling and the topping is brown on top and cooked through, about 15 to 20 minutes. 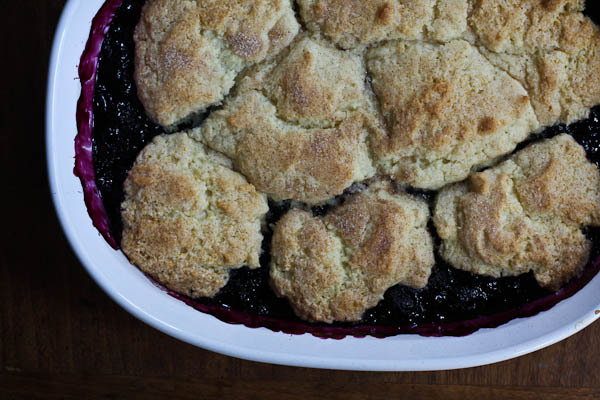 Let the cobbler cool on a wire rack for at least 15 minutes prior to serving. Cobbler adapted from the recipe for Fruit Cobbler in The America's Test Kitchen Family Cookbook . Cooking will always be there to go back to. Sometimes more important things get in the way. My husband would love these pecans. I will have to give them a try. Glad your dad is doing better sweetie. How wonderful your Dad is on the improve. I made maple candied walnuts recently. They were delicious. Candied nuts are relly nice mixed with roquefort cheese in a sandwich. So glad to hear that your Father is doing better and that you’re feeling more like yourself again. Take good care of yourself! So glad to hear you’re in the kitchen again and picking up your camera. Thanks for the inspiration–for the neighborhood holiday cookie/treat swap. Shhh. . . don’t tell. Hope your dad pulls through soon and completely. I know what it’s like to sit and hold a father’s hand in the ICU. I’ve been there–my heart and prayers are with you. So sorry to hear about your dad but glad he is doing better, will be praying for him. 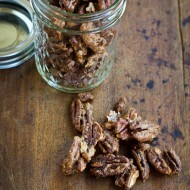 Here I Georgia, we are always looking for ways to serve up pecans, I have many versions of candied pecans but I haven’t seen one with the maple syrup. 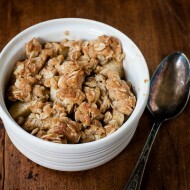 Will put this on my “must try” list for when pecans begin to drop this season! Well, of course these pecans didn’t find their way to your Dad’s nurse. You had to do quality control and market research before any such gift could be made. We’re so glad to hear that your Dad’s making such big strides!!! I always include some form of candied nuts in holiday gift baskets and these hit the right notes…just a subtle touch of heat with the sweet! Good to hear things seem to have turned for the better with your Dad. Mine is so far away, as hard as it has been, at least be grateful you are close at hand during this crisis. So glad to hear your father is making positive progress – that is certainly good news. Those pecans look and sound amazing. Must check out that cookbook. I’m glad to see you got back into the kitchen. I’m also very happy to hear about your dad. Nightly prayers and good thoughts are being sent your way on a daily basis. The recipe looks great and your photos are beautiful, Merry! Truly sorry to read about your father on this first visit to your lovely website. Having lost my wonderful Dad to lung cancer, it weighs on my heart to read of another loving daughter holding her Dad’s hand and praying. Both this recipe and the spice pecans are very similar to mine, the one twist you might want to try occasionally is to add a dash of tumeric to the spiced version. I occasionally add a tablespoon of Droste cacao powder to my candied pecan recipe – love the bittersweet cacao with the cayenne on the candied pecans (a lingering love for chocolate and chili powder combos from living in Santa Fe). Do hope that your father continues to heal and know you are relieved that he is off the ventilator.